In the past weekend, I watched one of the last screenings of the Steve Jobs movie picture. The picture starts with footage of Arthur C. Clark, at a (probably) 60’s datacenter explaining to the reporter that in a near future, humans will have in their hands a miniaturised computer which they will have access to information. By the effect of the minicomputer intrusion, Arthur also points that future society will become dependent and blended with technology. This kind of assumptions are the ones that mark the character of a futurist, that can predict and envision years ahead what we are becoming to be, not the other way around, as we, part of a jittery, mouth-full instant communication global community, started to assume that futurists are the ones that can predict what it is going to happen in the next 6 months, or next year. During the last couple of months I been in contact with at least two hands full of financial institutions. In most of them, the business initiatives around social business, ranked on top of their transformation programs, once they realised that letting customers blow to the horn when they are angry, damages the reputation of institution, as well as, social media should be used to serve the customer. With this in mind, banks wish to have an upgrade of the brand new 360 degree view of the customer. Hence, in the CRM system, apart of the account statements, the financial products the customer subscribed, it will integrate his social media feed, with social listening and sentiment analysis features. There is nothing new on this, the novelty is the customer profile built around the what we know about him, taking into consideration the spending partners, the investments done, the risk profile, combined how he expresses in social media, builds who the customer is. Or not. Technological advances have open the door in the emergence of services that perform financial advisory services. Despite there are some regulation barriers to comply, the financial personal assistance is here to stay. The financial assistant, leveraged among others by machine learning, high performance computing and natural language processing are able determine the best investment needs, your tolerance to risk and what are your goals to be achieved. However there is some room for improvement on adjusting to investment portfolio or your debt stack taking into consideration portfolio diversification or futures in economy growth or income fluctuations. One of the biggest barriers to break is the fact that customers operate with multiple banks and such kind of intelligent advisory services stumble in the lack of open interoperability. Last, there is an emotional factor, which is, the human lifecycle phase that dictates our inherent needs and wants. Someone that is heading retirement have very different needs from the ones that are starting their professional life. And some humans do not want to retire at all, despite there are in a certain age. Luciano Fiordi, in his book called the fourth revolution, quickly points one of the foundational philosophical well-know distinction between who we are – let us call this our personal identities – and who we think we are – call this our self-conception. The two selves-our personal identities and our self-conceptions – flourish only if they support each other in a mutually healthy relationship. Things get more complicated because our self-conceptions, in turn, are sufficiently flexible to be shaped by whom we are told to be, and how we wish to be perceived. Hence, the dream that bankers have about understanding who are you and how they can serve you better, it is still far for reality. This should not only be a reflection point in the banking industry, as well as across the mass market verticals. For those industry sectors like retail that are in the forefront of understanding customer behaviour it could be interesting for banks to carry a join design experience on who the customer really is. There is still a very long road ahead how to better serve bank’s customers. This is year we can sense and watch the transition to the massification of digital business and big computing analytics. From a system thinking perspective there are mindful discussions how to properly design the solutions that are changing how enterprises, governments, are operating, how social interaction technology are creating flat organisations, as also as, how humans are becoming lazy and distracted by the increasing confidence transfer to information systems. Luciano Floridi, a Manuel Castells contemporary, calls this new age the infosphere, the combination of the internet and computer technology that is revolutionising our lives and work, and points out that in the same way, cloud, mobile and social put the power in the hands of the consumer, rather than in the companies we engage in, to become entrepreneurs and support a must needed self-economy, also it suggests that the revolution is as much about issues of morality, privacy, identity and meaning as it is about technology and what the new ecosystem can do, both for us and against us. I used UBER for the first time 3 weeks ago, I was really interested to figure it out how the brokerage system works and the only flaw I found it is the lack of granular accuracy of the GPS that must be improved, particularly, when you are located in designated pick-up locations at airports, plazas, and multiple intersections (when used again the system, I notice this is definitely an improvement area). From a consumer point of view, it is cheaper than use a regular taxy service, with brand new, clean cars and polite drivers. Value proposition accomplished. When you decompose internally the business model from the drivers point of view, it surfaces a different reality. In some regions, where drivers don’t have access to credit, they end up or driving someone’s else vehicle – like the taxy companies – that suppress 60% of the fare, Uber takes another 20%, meaning that in the end, the driver keeps only 20% of the remaining value. The driver must also feeds the fuel, hence what it takes as a result of his work is close to a meaningless figure. This is close to induced modern slavery isn’t it? Of course that driver knows it all, but he continues to believe in the dream of making trough, rather than stay in a unemployed condition, or working for a classic taxy company. In the end, some new digital transformation ventures, can be very promising and tear down outdated business models that consumers are not willing to pay for it anymore, but when you look it deeper, it is just a market power transfer to the new entrants against the incumbents. The so called self-economy can aggravate the social inequality and responsibility of a business. Everybody is contributing to it. I am writing these words one week after the terror attacks on Charlie Hebdo newspaper in France that sparked a long series of discussions about the reasons those attacks happen. One of the consequences of the incident, was the intention of the British government to enforce a policy that blocks citizens access to encrypted software applications, in order the government can listen, read and extract what it considers to be relevant information to avoid security risks. The intention, aligned with what happened during the riots in London some years ago, where the police requested to Blackberry a mean to have access to the conversations of the looters (as the security forces leaned they were using Blackberry software to plan and execute the attacks) is creating a sound-wave of criticism. Against the intention are brought reasonable arguments about our own privacy and on the other side, there are also important arguments about defending ourselves against terror or criminal activity. What I think is key around this discussion, is not the political or other motivational values, which in either case are valid. The key concern is consent. Consent to access our personal data. It is very interesting to analyse from a societal point of view, is how some people are deeply concerned with personal data access from 3rd parties, when such concern does not exist about how a bank account manager can understand our lifestyle just looking to the bank statement entries. It seems that the society is not concern with that anymore, or to the fact that we allow software companies to track our life when we use our smartphone, to lead our habits in a way that some content that is presented in maps, social networks, news are today partially biased, based in our browsing attitude, the places we travel, the information we read and our shopping habits. Smartphones become learning machines about what we do. Marie Wallace, made a very interesting presentation called “Privacy by Design: Humanizing Analytics” where she discussed the principles on how to create software applying the privacy by design principle. What I think the challenge is, as I expressed in Marie’s blog, more than discussing on rules, policies and how to implemented coding, is the foundation principle on what should be private. The definition of a concept, a domain, is a consequence of the surroundings, of the environment we live and the multitude of human principles and beliefs. What in a society can be accepted as a practice in other can be condemned. Privacy it is not anymore what it used to be. Take for example the attitude of different generations how they expose their life in social networks. The concept of privacy is constantly being redefined to a point that can be transform into a matter of transparency, for example, sharing your taxes declarations if you are a politician. But much beyond this, is how youngsters deal with it. In the past, kids interact in the street, today they are living in real time as much as they can. They broadcast their lives to his friends. As the younger generation that reach the labor market are used to be connected to information, the next generation will be in perpetual broadcast. Privacy will probably need to be redefined. This concept of privacy is also challenged by the concept of transparency. In the book, the Circle, a novel by Dave Eggers, it is explored that in the future society must be transparent. Being transparent means you are not afraid of hiding your medical records because it can save your life, as also your are not afraid of exposing your earnings and tax situation. The book, pitches the necessity our of world become transparent (in a way a fictional software company creates applications where all our life is part of that company) in order to avoid crime, bribery, corruption. It particularly explores the trade off how becoming transparent, giving up our privacy, the world will become a better place, something that future generations probably will not care about and can create clashes against elderly generations. The flip side, is the classic Orwellian apocalypse that looms and take control of our society. One of the solutions, to protect our privacy is as Butler W. Lampson points out, citizens own the data and define who can have access to it, again the consent principle. What people most often want is a sense of control over their data (even if they don’t exercise this control very often). Many people feel that this control is a fundamental human right (thinking of personal data as an extension of the self), or an essential part of your property rights to your data. The concept is aligned as someone already coined the era of the personal cloud, the challenge is, as Butler adds, societies around the world have different cultural norms and governments have different priorities, there will not be a single worldwide regulatory regime. However, it does seem possible to have a single set of basic technical mechanisms that support regulation. However, will the governments rise against the new business models that use the principle, we own your data? Our we will give up our privacy and become transparent? Here is the list of BPM blogs I think work reading. This year there is a shift since I started to create the list. There are less pure BPM blogs. Nevertheless, here is the list, arranged by the first time, in categories. Bp-3: Scott Francis’s blog brings the most balanced views (and close to the truth). BPM redux – Theo Priestley’s is Andy Warhol’s of BPM . Business Process Management Virtual Environments -Innovation driven BPM starts here by Ross Brown. Column 2: For me the best analyst blog. Great insights from BPMS systems and event coverage brought by Sandy Kemsley. Ground-Floor BPM – E. Scott Menter deconstructs the myths of BPM and BPMS. Improving Enterprise BPMS – A great blog to look for frameworks by Alexander Samarin. Jim Sinur: Good insights about BPM future trends. Welcome to the real It world: Max Pucher is the most outspoken BPM blogger on earth. Flux Capacitor – The place to look for process mining, from Fluxicon. Collaborative Planning & Social Business: Keith Sewson brings insights around social business, more business oriented. On Web Strategy – Dion Hinchcliffe writes about social business. Social Enterprise – Emanuele Quintarelli writes about social business. The Smart Work Company – Anne Marie’s writes about the future of work, and the human side of business. KWKeirstead’s Blog – Karl Walter writes about knowledge workers and knowledge management. A Software Insider’s Point of View – Ray Wang, talks about social business, sharp. Social Enterprise Today – A blog of blogs around social business. Sonnez en can d’absence – Adaptation, complexity, chaos, brought to you by Thierry de Baillon. Texology Sciences – William Reed, writes about complexity. IFF Blog – A blog about complexity. Tetradian – Tom Grave´s writes about enterprise architecture. If you are interested in 2012 list click here. Till next year! I hosted a workshop at the Process Mining Camp 2013 about Social Mining. Here are the results of the discussion with my peers and fellow miners. We’ve been supporting our way of working, based on the increased processing capacity of information systems that have created the illusion that the world was more stable, predictable and standardized. However the pace of change in the economy has been increasingly accelerated, fuelled by a nexus of converging forces — social, mobile, cloud and information — is building upon and transforming user behaviour while creating new business opportunities that let people do extraordinary things and are automating repetitive tasks and decision making at large. This implies that our vision of the future has to be changed. Any system, any process must be able to handle the complexity of its elements and be active and adaptive to survive. This implies that any attempt to limit the existing variety will lead to the system, the process, the organization will lose the ability to adapt. This is the reason that business processes are not anymore normalized, standardized and are getting more difficult to analyze. For sure there are research methods to tackle this kind of challenges, there is an example like Simplifying Discovered Process Models from Dirk Fahland, Wil M.P. van der Aalst, but the thing is variation, complexity cannot be predicted, and such methods can work in predefined or controlled because organizations live in a world where interdependence, self-organization and emergence are agility, adaptability and flexibility. It is a networked composed world in the design of collaborative-networked organizations. These networked configurations comes to the composition of complex systems, from cells, to society and enterprises (associations of individuals, technology and products). In those complex systems, characteristics of emergence, order and self-organization, develop a set of network interdependent actions not visible in the individual parts. This is the reason why defining methods to analyze a domain fail if the domain and the parts change, which is what most of the times occurs once we are living in a world of variety. There a hand full of facts that are changing everything the way we work, basically that are two domains that are making a huge pressure on enterprises. 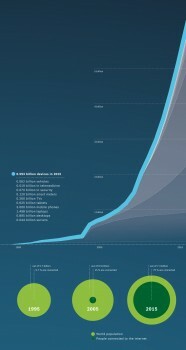 As communication costs drops and speeds increase, cost will no longer be a consideration in many parts of the world. As the cost of communication drops, the shift will be towards applications. Combined with increased computer capacity and speed, we will be able engage with, and have access to information in real time. Cloud will free organisations from fixed and limited availability and processing power. The way we are used to working will dramatically change. On the social factor, in leading GDP countries, we are facing a displacement of “assembly line” people to aspiring ones; this is because work can be transferred to those that can do the same thing for less than a half of the cost. This shift occurs in industry sectors from manufacturing to services. But in the near future tiny tasks will be fully automated and unfortunately those brave workers will be obliterated, unless there are new work opportunities, or chances to execute more complex work. People will have to adapt and start pushing their capabilities to new boundaries. This shift has also a profound implication on the type of people companies are sourcing in the labor market. As leading companies expand and operations are outsourced or transferred to low wages economies, the future workers profile will be aimed at highly skilled persons capable of embracing business dynamics. The complexity were are living with, implies that we to look and align other kind of dimensions we were not used to look before to tackle the factors that are transforming the way processes are executed. Control flow perspective does not provide any kind of insight because there are not two similar instances and because under social collaboration paradigms the process is the conversation or the interaction and there are infinite ways to do that. Time perspective is important and will continue to be important but is definitely not the best way to understand behaviour. In fact today we have immense analytical capabilities, but how do we understand a fundamental challenge for organizations that is how people socialize? How do they work? the configuration makes sense? It is too centralized, depends always from the same person and the same organizational units or is open and anyone can be invited to join? The type of knowledge applied is abstract, i.e. people can apply recurrent solutions to daily problems in a multitude of situations, and only apply customized solutions (concrete knowledge)? Knowledge is reused? Information flows naturally or processes are too structured and best practice oriented that are turning organizations into fragile systems because they are not able to change, react to unpredictable facts and adapt? This was the background of the workshop. Our society is constructed around flows. This construction is also applied inside organizations and among its stakeholders. This is what we are made of. Flows are the sequence of interaction between physically disjointed positions held by social actors, that belong to a particular social network. Dominant social structure are those arrangements of organizations whose internal logic plays a strategic role in shaping social practices. Thence the trick is you are able to align network structure to the process type being executed and evolve the network type according to circumstances. In order words, you need to introduce and maintain an adaptive social approach. But that is not enough. You can have the best social network configuration, but knowledge is poorly used, or you let people set them free when it should be supposed to reuse solutions all and over again. Once the process transformed into something that is the conversation, we need to understand how people engage. In other words, what is the network configuration. It’s somehow accepted that network patterns can indicate the way people work and share information. As a reference on social network patterns, and social network discovery techniques you can learn it here in this post. Centrality is used to measure degree distribution. But all measures are wrong and some are useful. Privacy concerns. There is a clear division about the approach how information is considered private across different parts of the globe. For example, in most European countries, at large, data like e-mail, stored in the employer devices is still personal, even if it is corporate e-mail. This challenge is amplified if data is stored in personal e-mail or devices even if it is from corporate source). Building the complete log can be overwhelming if social interaction is spread in multiples systems. Without entering into technical details, is much more difficult that joining different database tables. It’s more important if the social dimension could be embedded in the control flow, rather than being analyzed separately. If the process is the flow and the process is social the visualization should be integrated. I consider that this point is key for developers. Healthcare industry has always been characterized by the involvement of multiple professionals for diagnosis and treatment of patients where information sharing plays a key role. Health professionals (as well as professionals from other industries), tend to work around problems, address the immediate needs of patients rather than resolve ambiguities. As a result, people face “the same issue, every day indefinitely,” which results into inefficiency. In other words, people like to design, the same solutions always. How can you overcome this challenge and what can be done so that the knowledge use can be more abstract and knowledge itself can evolve within the organization? Knowledge consumption should be aligned with the type process design. For example a repetitive task is usually automated turning into explicit knowledge use, documented and understood by all. There is often a temptation to simplify the existing complexity, automating and standardizing how to proceed to the point of “crystallize” only a small part of the information that people have to process, making it difficult to cope with the changing conditions of execution, thus leaving no room to use of the tacit dimension. Knowledge is not then just a twin flavor (explicit or tacit) but it’s more than that. How to discover and measure knowledge type? There can be different types across parts of the process and measuring is not automatic. People would like to spot the indispensables. The ones that makes the difference, when a solution is build. That could be measured by how many person in the company “like”, use, apply the knowledge that was created. knowledge repositories are not considered to be useful. The lynchpins, the indispensables, don’t like to codify it’s knowledge, because it makes them … dispensable (I tend to agree, but there are some generations that live under the share paradigm and make the others contribute to the company success). Knowledge finding automation is highly requested. Even with a Swiss army of systems to manage knowledge, it’s hard to find. Process are not from a single flavor anymore. Today it’s possible to find a very pre-defined type, but also a blend of every type available across multiples process instances. Today processes are blended. You can handle a claim with a customer in a loosely manner and in the end pay a compensation using a by the book, best practice, “ever day the same thing”. How to understand what process type we are looking at? The structured ones are easy to find, but Ad-hoc and Adaptive put extra challenges, particularly if parts are blended with structured ones. Most important that have super algorithms to spot patterns and discover process types, at this point of time is more important to have access to recorded data to actually let people think. On part 1, I introduced the importance of social network understanding as the socialization of interactions is becoming a new working habit and as such classic control flow perspective analysis does not anymore provide information about how work is done. On this post, I will explore important points to look for when performing Social Network Analysis (SNA). Emergence: agents that belong to the network interact in an apparently random way. This feeling is amplified if there are many agents and / or there are too many interactions that make difficult to extract patterns. Emergence is all about separating the signal form the noise and make those patterns to emerge. Adaptation: enterprises, communities, exist confined in a particular environment that when changes it makes agents to react. Environment can be external, interaction with customers, suppliers, government agencies; influence like the publication of a new law or regulation or competitor movements as they enter in new markets or create new products or services. Environment can also be internal and its related to the way agents interact that is ultimately associated with how business processes were designed, how IT solutions were deployed, culture, hierarchy configuration and formal recognition of authority, just to provide some examples. Variety: Ashby, one of the father’s of cybernetics, defined the Law of Requisite Variety “variety absorbs variety, defines the minimum number of states necessary for a controller to control a system of a given number of states.” For an organisation, to be viable it must be capable of coping with the variety (complexity) of the environment in which it operates. Managing complexity is the essence of a manager’s activity. Controlling a situation means being able to deal with its complexity, that is, its variety . Connectivity: The way agents are connected and how those connections are aligned with the process type that was designed / being executed and the type of knowledge that is necessary to support operations (more about this alignment here). The existing connections will unveil the emergent patterns that are necessary to identify and understand behaviour under a social point of view (high coupling or loosely coupling between agents or group of agents). Most of the times when people refer to social networks they are expressing their beliefs on community networks like Facebook, subject expert groups like enterprise wikis. Although those are important network types, they do not express the nature of organization operations, because they do not record communication acts expressed on social activity, hence I will only concentrate on Coordination Networks. A Coordination Network is a network formed by agents related to each other by recorded coordination acts. Coordination acts are for example, the interchange of emails, tasks as design on enterprise systems or activity streams just to provide some examples. The above definition is an adaptation of  because it does not include the importance of coordination act that is related with the nature of work, rather the connection itself. The former is the important dimension related with business process management and will guide the remaining content. Coordination acts is meant to be as defined (adapted)  an act to be performed by one agent, directed to other agent that contains an intention (request, promise, question, assertion) and a proposition (something that is or could be the case in the social world). In the intention, the agent proclaims its social attitude with respect to the proposition. In the proposition, the agent proclaims the fact and the associated time the intention is all about, recorded by the system, supporting the definition Coordination networks, which configuration that can ultimately be discovered, patterns emerge, using discovering techniques like for example process mining. Community discovery: measures alignment of connections regarding organization hierarchy. There is an immense list of techniques to analyse each one of the above dimensions, that reflects the high maturity level of each method, but he drawback is that SNA analysed on each dimension alone can induce managers in the wrong direction. For example, studying community discovery can be important, because communities are a collection of individuals who are linked or related by some sort of relation. But carrying the analysis without taking into consideration the content of the conversation (coordination act) that drove the creation of the link is absolutely wrong, because the conversation is all about the way we humans work. I tend to disagree with other points of view from other practitioners that conversation does not matter (probably because they were influenced by Gordon Pask), only the network configuration. Conversation (the process) is the matter of study. Social networks are self-organizing systems, but there are important patterns that emerge from the nature of the coordination acts that can be identified. Despite there are random factors and the type of patterns presented in most of scientific papers are based on graph theory and tend to be very simple compared with the reality (and hence maybe this is one of the reasons they are not taken seriously) it is the only way, as an abstraction, to understand agent behaviour. Pattern recognition is critical to align process type (from structured to unstructured), knowledge domain (simple to chaotic) and network type (central to loosely coupled). In order words, to infer trends and help humans to interact better regarding the role they play in the process ecosystem. Having said that, I would like to invoke Stafford Beer’s on models: “in general we use models in order to learn something about the thing modelled (unless they are just for fun)” . Centrality is used to measure degree distribution. Centrality  is described as a process participant, business unit, group (a set of process participants or people) or an enterprise system (do not forget the machines) within the context of a social network. 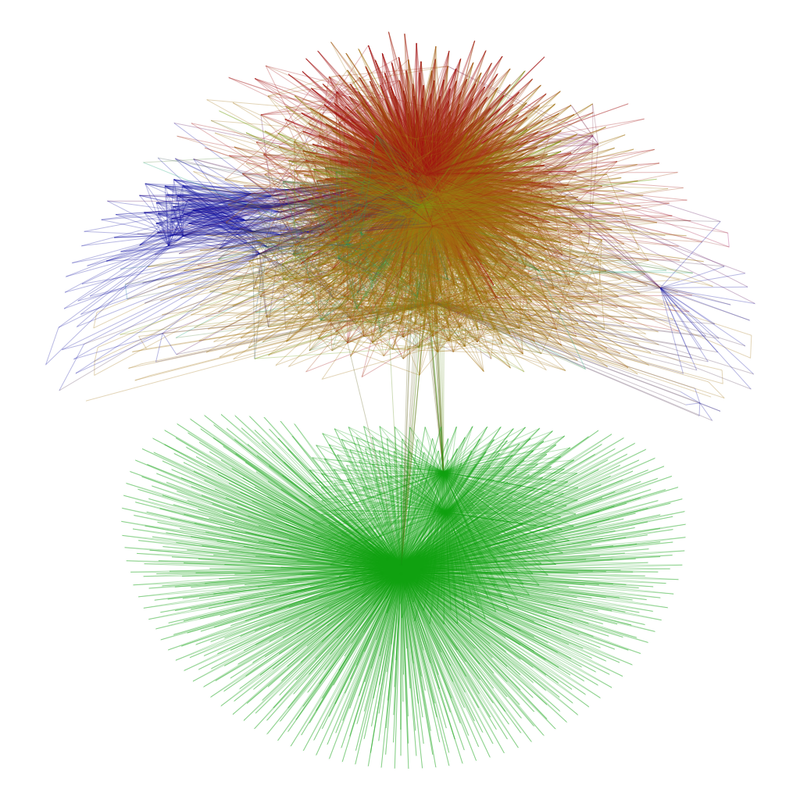 Centrality is also related with discovering the key players in social networks. Degree centrality: calculate how many links a node has regarding the remaining network nodes (commonly called network stars). 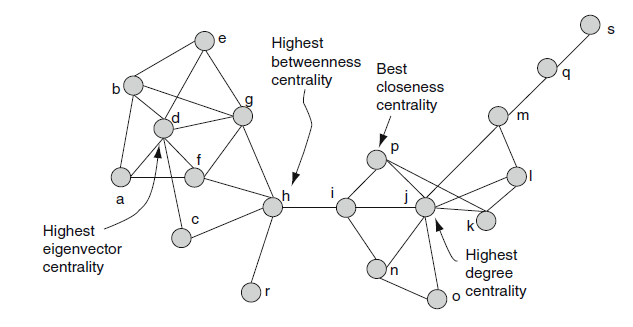 Higher degree centrality means higher probability of receiving information (but does not mean it drives information flow inside of the network). Betweenness: measures the degree witch a process participant controls information flow. They act as brokers. The higher the value, higher is information flow traffic that moves from each node to every other node in the network. The importance of Betweenness in social network analysis is nodes with higher values stop processing coordination acts, will block information flow to run properly. Closeness: measures how close a node is isolated in the network compared with other network mode. Nodes with low closeness are able to reach or be reached by most of all other nodes in the network, in other words low closeness means a node is well positioned to receive information early when it has more value. Closeness measure must be supported on time dimension (see reference about the timestamp attribute on the coordination act exemplification), without it, is useless. Eigenvector centrality: used to calculate node influence in the network. Higher scores means a node can influence (touch) many other important nodes. There is a lot of noise around what is the best measure to perform SNA, as I learned at the User Modelling, Adaptation and Personalization Conference 2011 it’s time to put the mathematical equations aside and practice it’s application. At this moment of time, there are plenty of ways to measure network centrality, but somehow they neglect that those algorithms are not appropriate regarding the type of business process / information system interaction played. For example, Eigenvector centrality measure is important in unstructured processes, where the path is defined on instance mode and it is necessary to create a team and involve others as the process progress. 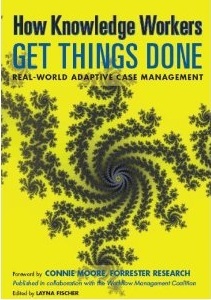 Once SNA does not analyze the process type, only about agent relation, if applied analyzing a procure to pay process (highly structured process type) it’s useless and can damage results interpretation, because on this case, every agent, every process participant receives and process information basically the same way to achieve the same outcome every same day. Maybe this is the reason why is not yet taken more seriously, because these days the process is all about social interaction and it cannot anymore be analyzed naively taking into consideration the dispersion, complexity and interdependence of relationships, something that can also be applied on IT requirements elicitation or IT system operation , which allows to understand communities interaction in order to support emerging and unique processes under a techno-social systems approach . On the previous article about A Social Platform Definition, I presented a framework about the elements of such Platform. The following articles I will expand each of the layers. This one is dedicated to the Search and Analysis component. Before we dig into the component content, I would like to bring some background about its significance. Last week, I had a meeting with a college headmaster to figure it out if there was alignment between me and the headmaster’s expectations and values regarding how students will be prepared for the forthcoming decades, taking into consideration the shift we are facing regarding work patterns, information overload and technology disruption. The institution is catholic oriented and have strong roots with the Catholic Church. Let me say that I do not consider myself catholic as by the book definition, but probably I’m more catholic that others that go to the church every day and don’t have ethics and values. This means I did not choose to evaluate the institution because it is linked with my religious beliefs, but because they are the best institution according to the evaluation program that was created by the Portuguese Government some years ago. During the interaction with the headmaster (a religious person), we talked about two vectors I introduced into the conversation: values and student preparation for the forthcoming decades (how we prepare people to interpret and act on information and how they improve reasoning in the knowledge era). When the headmaster was talking about values, introduced an amazing characteristic from the human being point of view (sorry by the religious background I’m putting into the discussion but I consider that it’s worth for the sake of clarification about social network analysis). God created humans as a single and unique entity. There are no equal human beings (even perfect twins) and God created animals and all the other living organisms differently that belong to a system (let us call planet earth that belongs to other system called the universe) made by diversity in constant balance and adaptation. This point of view opens and reinforces the main characteristic that we humans who belong to families, communities, organizations, arrangements that are part of a super system called the universe whose foundations rely on the top of diversity and complexity, not on standardization. Somehow, we keep pushing in into an ordered regime because it is much simpler to understand concepts, interactions and our own existence in an controlled manner rather than in a complex one. Ashby’s law teaches us that any system must match the complexity of its elements in an actively and adaptive way to survive and prosper. In addition, Ashby pointed out other important conclusion: any attempt to limit part of the variety (because it is considered noise by the humans) that constitutes the system will lead that the system will lose the capacity to adapt and lead into implosion. This reflects in the way some business processes cannot respond to exception handling, because the misleading adaptation consists into fighting against the process model rather than adapt to changing executing conditions. If we consider a different organization layer like strategy management, think when external signs are ignored that can lead the organization to bankruptcy or financial loss. In the social era we are being misleading about what is Social Network Analysis, one of the reasons it is about the semantics, the meaning of Social, broadly understood connected people, but a Social Network is much more than that. In very general terms a Social Network can be described as a graph whose nodes (vertices) identify the elements of the system. The set of connecting links (edges) represents the presence of a relation or interaction among these elements. With such a high level of generality it is easy to perceive that a wide array of systems can be approached within the framework of network theory . Social Networks can be made of Organizational Units, Business Units, Roles and Functions, Individuals, Data, Technology consumption (what part of the IT solution is used), Technology interaction (how IT solutions communicate), Business Processes, Traffic, Biological, Physics (these last two categories lend so much of its properties to business analysis) etc. All the networks are self organizing systems, but there are important patterns that can be identified anywhere from the self organization, despite randomness, patterns are critical for humans to understand how data can be transformed into information, that ultimately is transformed into knowledge used to understand the behavior of such networks (see note below). Self-organization refers to the fact that a system’s structure or organization appears without explicit control or constraints from outside the system. In other words, the organization is intrinsic to the self-organizing system and results from internal constraints or mechanisms, due to local interactions between its components  (that can be put on top of a business process). These interactions are often indirect thanks to the environment. The system dynamics modifies also its environment, and the modifications of the external environment influence in turn the system, but without disturbing the internal mechanisms leading to organization  (think for example social interaction with customers that change the course of the business process, or events during product research and development that makes to alter the characteristics and features). The system evolves dynamically either in time or space, it can maintain a stable form or can show transient phenomena. In fact, from these interactions, emergent properties appear transcending the properties of all the individual sub-units of the system  (and these emergent properties are the ones than be understood using a combined set of discovering techniques like process mining, social network analysis and data mining). I tend to agree that with argument that looking for patterns into a complex landscape is a waste of time for the reason that into complex domains any attempt to take a snapshot is a distorted version of the reality. Nevertheless, the objective of patterns discovery and understanding is not to predict behavior but to infer trends or in Jason Silva’s words “to understand is to perceive patterns” http://vimeo.com/34182381 . The objective of Social Network Analysis is not to predict outcomes, but to understand, to construct knowledge around emergence self-organization and adaptation in scenarios like for example decision making or distributed systems that are becoming real enterprise challenges as business complexity and interactions grow exponentially. Huge amount of data is being recorded today (see image bellow) that allow us to make discovery and analysis of complex interactions. The argument that does exist and it cannot be done only fits in a category like airport security information that typically relies on paper. On part two, I will explore techniques to analyze social networks. On Fastcompany’s article: “IBM’s Watson Is Learning Its Way To Saving Lives” is said that “Watson is poised to change the way human beings make decisions about medicine, finance, and work” […] “They believed Watson could help doctors make diagnoses and, even more important, select treatments”. I argue that IT can help humans to process and show data to help humans to make better decisions. Last weekend, a family member stood at a hospital during a day making analysis on what could have been a heart attack. Diagnosis were automatic: they make a 1 minute electrocardiogram (considered insufficient by experts) combined among others with measurement of troponin levels (diagnostic marker for various heart disorders). The results found correlation between the results and the family member was told a cardiologist should immediately see him. When the cardiologist looked to the results he said that there was no correlation at all, the results of the electrocardiogram were insufficient and the troponin level was 1/100 of the danger threshold and was unlikely to raise suddenly. In the end the diagnostic was wrong and the cause of sickness was nervous system. This evidence like many others should make us think as Einstein said: “Information is not knowledge, the only source of knowledge is experience”; I would add information cannot be stored.